We having been tracking our health as we climb. We are at about 11,000 feet. No signs of altitude illness yet. Our oxygen saturations have dropped to 90%. We used to be 97% in Kathmandu. Our ability to blow out air, as measured by peak flow has dropped by approximately 50 ml. Our pulse has increased by about 10-20 beats. We are feeling healthy though. Our joints don't seem to mind the constant up and down. Ironically we did check the pulse and saturations of a number of Sherpa last night. Their pulse was ~80, their saturations ~90%, and their hemoglobin counts were similar to ours - we are tracking our hemoglobin as well, it has not changed much. We love the scenery. 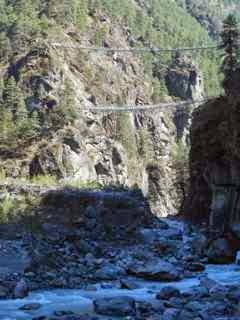 Here is a bridge with prayer flags. The top bridge is new so we used it. The bottom bridge is old, but people still use it. The bridges so far have been made of metal cables and metal planks. They are not perfect as we saw one bridge where the metal planks broke - we had to walk around this very carefully - I guess the yak was too heavy.